In a recent post to his popular yournz blog, Pete George said that Polynesians never visited Australia, & never encountered Aboriginal cultures. George's claim reflects received opinion, but there are some neglected pieces of evidence that suggest it is wrong. We tend to think of the Polynesians sailing east, because of the explosion of voyages out of their Tongan & Samoan heartland fifteen hundred years ago. We know now their vaka made it all the way to the Americas. But Polynesians also went west - much further west than Australia. They founded colonies on islands like Kapingamarangi and Nukuoro, which are northwest of the Philippines. Obsidian from Tuhua Island, in the Bay of Plenty, has been found in the Kermadecs, proving that early settlers of Aotearoa journeyed north, toward their ancestral homelands. Norfolk Island's soil has given up numerous Polynesian artefacts, including adzes. 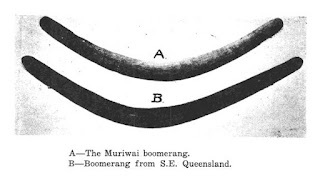 While the finds in the Kermadecs & on Norfolk are well-known, very little publicity has ever attached itself to the discovery of a Polynesian adze on the coast of New South Wales in 1929. The adze sat forgotten for decades, but was recently analysed by three Australian scholars. The Australian team found that the adze from NSW bore many similarities to artefacts found on Norfolk. They decided that it is likely a relic of a Polynesian journey from Norfolk to the continent. No scholar, let alone team of scholars, has ever systematically investigated the possibility that Polynesians visited Australia. Those artefacts that hint at such a visit, like the NSW adze & a fragment of pounamu that turned up in Tasmania, were found by chance. There are hints that Polynesians not only visited Australia but made return journeys east. 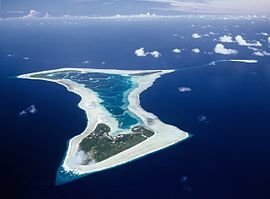 In 1993 a team of Japanese archaeologists made an astonishing but little-reported discovery on Pukapuka, the northernmost island of the Cooks. They dug up the bones of a dingo. The dingo is native to Australia. It has a cousin in Papua New Guinea, but is related only very distantly & indirectly to the Polynesian dog. If a dingo was present on the Polynesian island of Pukapuka centuries ago, then it would have had to have come from Australia. To be fair, some scholars dispute whether the creature unearthed on Pukapuka really was a dingo. Geoffrey Clark feels it may have been a European dog. But the Pukapuka dingo is not the only piece of evidence for return voyages by Polynesians from Oz. In 1925 a man fossicking amongst midden-dunes on Muriwai beach discovered a boomerang. His discovery was reported in the Journal of the Polynesian Society the next year. If Polynesians visited & even settled in Australia, then it might be possible to find traces of their presence in the stories & imagery of coastal Aboriginal peoples. The Muslim fishermen who visited Arnhem land for centuries left many reminders. There's another model for tracing ancient Polynesian contacts with Australia. Over the past decade or so scholars have found convincing evidence that Polynesians visited California, by probing the vocabulary & aquatechnology of the Chumash people, who live around Santa Barbara. Still getting a lot of spam Scott. But this is interesting. R.T.
We treat the evaluation process serious and don’t publish fake reviews. In this evolutionwriters reviews you can learn all information about the company which you won’t find elsewhere. Would love to take a quick peek to travelling towards Oz.